← What Breed Is Right For You? 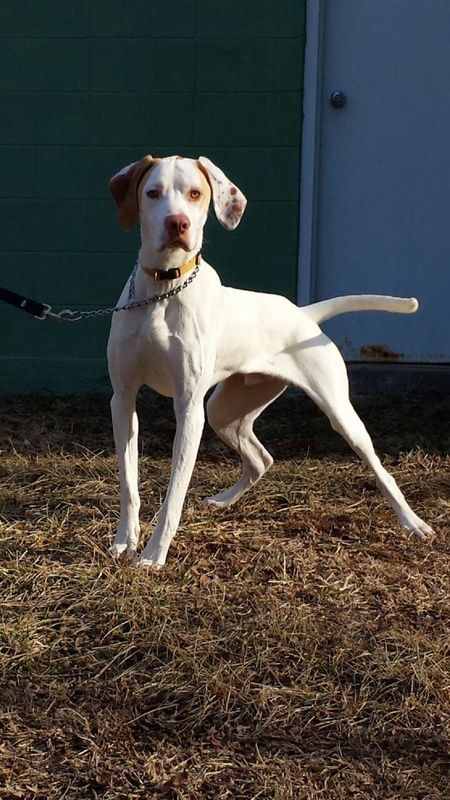 The Pointer, also known as the English Pointer or American Field Pointer, is a powerful sporting dog, is extremely high energy, and a very enthusiastic hunter. The first recorded mentions of the Pointer were in England around 1650. 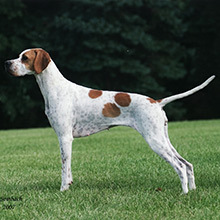 The Pointer was developed by crossing the Italian Pointer, Foxhound, Bloodhound, Greyhound, Newfounland, and Setter. The name derived from the way the dog stands motionless when he spots his game ~ as if he is pointing right at it. 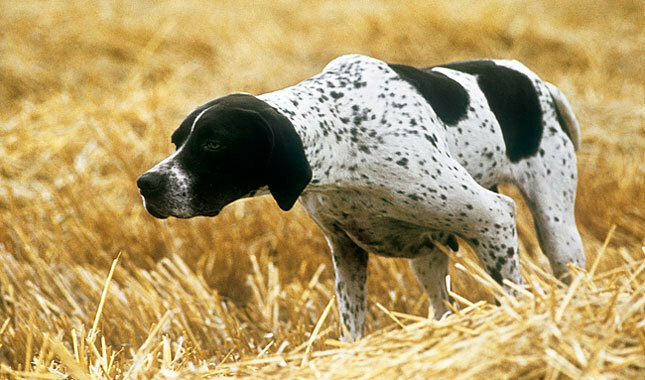 This breed is excellent at catching a scent, and pointing the hunter in the right direction. Often used to flush out birds, the dogs are very quick, and can cover a lot of ground in a short amount of time. They are not known to be water dogs. 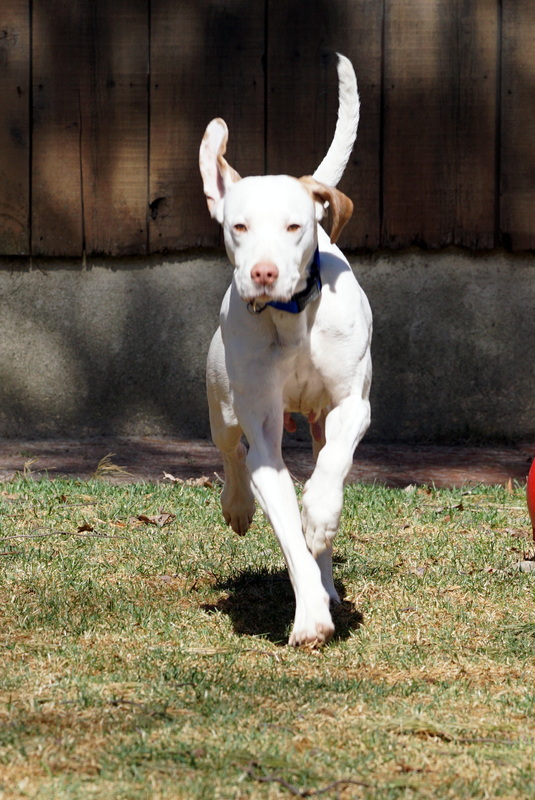 With enough exercise the Pointer will be calm in the home. 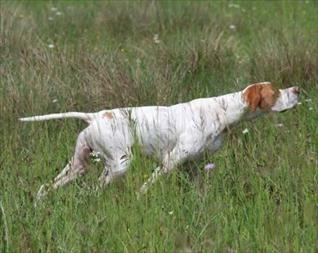 Pointers are known to be very intelligent, loyal , friendly, affectionate, and generally good with children. They are generally good with other pets and are not usually dog-aggressive. However, if not socialized properly, Pointers can be reserved with strangers. If you do not provide enough mental and physical stimulation, Pointers can become “,”high-strung and destructive. If they sense their owners are not strong-minded, they can become a bit uncooperative, as they will believe they need to be the leader of their pack. 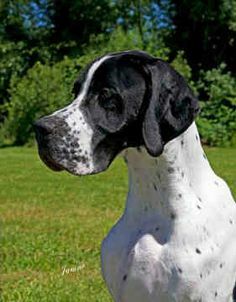 Pointers will bark at suspicious noises, but are not known to be a watchdog. Hunting instincts develop early. Pointer puppies will begin to display pointing behavior as young as 8 weeks old. These dogs are not recommended for apartment life. They are moderately active indoors and do best when provided with both mental and physical exercise. The smooth coat of the Pointer is very easy to groom, requiring regular brushing with a firm bristle brush and bath only when necessary. This breed is an average shedder. Their strong fast-growing nails should be trimmed regularly to avoid overgrowth, splitting and cracking. Their ears should be checked regularly to avoid a buildup of wax and debris which can result in an infection. Teeth should be brushed regularly. 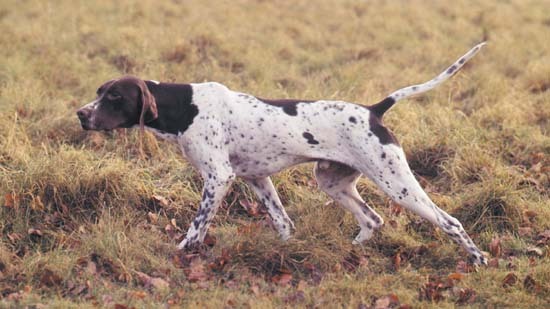 The Pointer’s even temperament and alert good sense make him a congenial companion both in the field and in the home, but he requires both physical and mental exercise. Pointers are extremely energetic, so it is very important that these dogs daily vigorous exercise to prevent indoor restlessness. Providing a securely fenced-in yard for a Pointer to stretch to burn off some of the renowned “hunt all day” endurance is most beneficial. This breed is more than a match for even the most active family and should not be taken on as a family pet unless they can guarantee plenty of vigorous exercise. They need to be taken on a daily, brisk walks or jogs. They are excellent jogging companions. Some love to swim and retrieve although they were not bred for that task. Like all breeds there may be some health issues, such as epilepsy, hip dysplasia, eye and autoimmune disorders such as skin allergies, and hypothyroidism). Even though parents have been x-rayed and cleared of genetic disorders, they can still carry the genes for them. It is always recommended that health tests be performed before you consider breeding your dog in order to decrease the odds of passing on harmful genes. 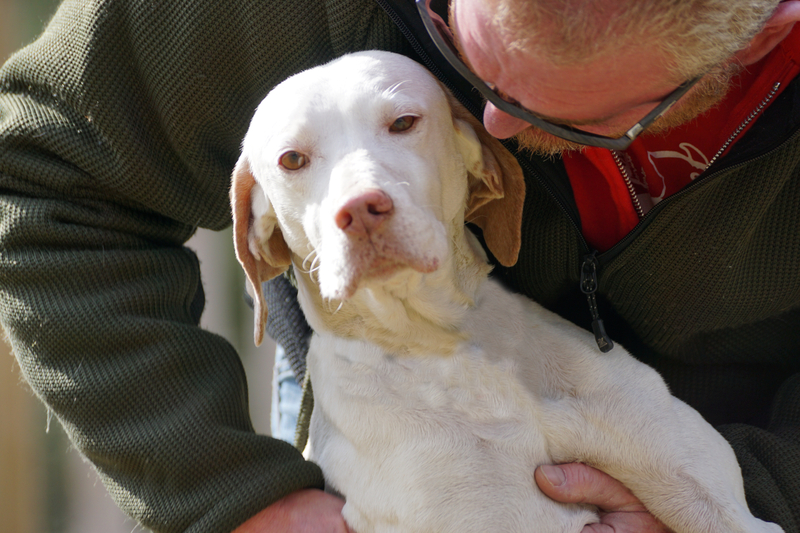 Some dogs may be faced with these health challenges in their lives, but the majority of Pointers are healthy dogs. Regular veterinary care and proper feeding are vital to your dog’s health. Yearly DHLPP vaccinations, rabies shots, a monthly heart worm and flea/tick preventative regimen, and in many parts of the country a Lyme Disease vaccination, should not be neglected. Follow the advice of your veterinarian for shots and monthly preventatives. If you plan to purchase a puppy, be sure to do your research and work with a responsible breeder. Good breeders utilize genetic testing of their dogs to reduce the likelihood of disease in their puppies. A MUST! If new to the breed, it would be beneficial to work with another individual who is knowledgeable about the breed. Be sure to educate yourself, and carefully match your training methods with the personality, characteristics, and needs of your dog. As with anything else, do your research on crate training. If introduced properly and in a positive manner, the crate becomes a safe haven and a secure “den” for the dog. The crate provides a safe place to go when things get too hectic and the dog needs a break. When the dog has to travel, its “safe place” can come along, and the dog will always have its den regardless of the circumstances. 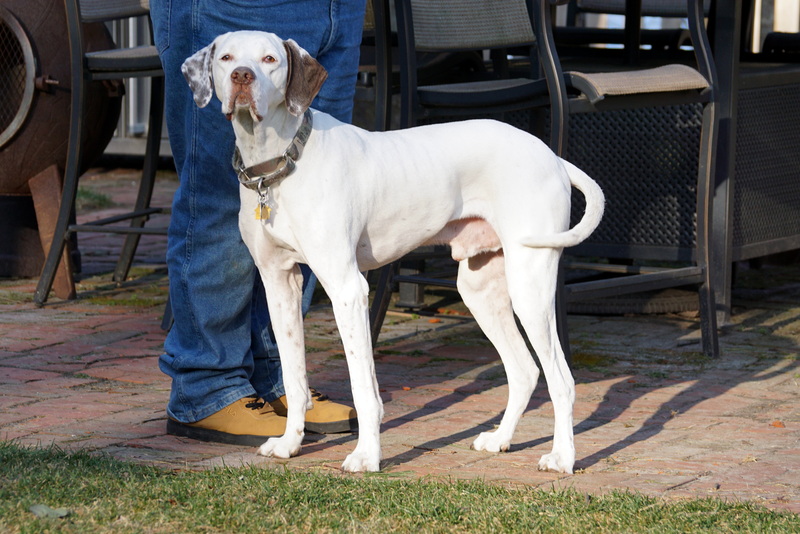 Founded in 1938, the American Pointer Club (APC) is a non-profit organization, the “guardian” of the breed and determines the official breed conformation standard. The Club sponsors Pointer competitions (field trial and hunting test, agility, obedience, and rally events); an annual National Field Championship that rotates between the eastern and western U.S. each year; plus regional and supported events for conformation, hunting tests, field trials, obedience and agility. 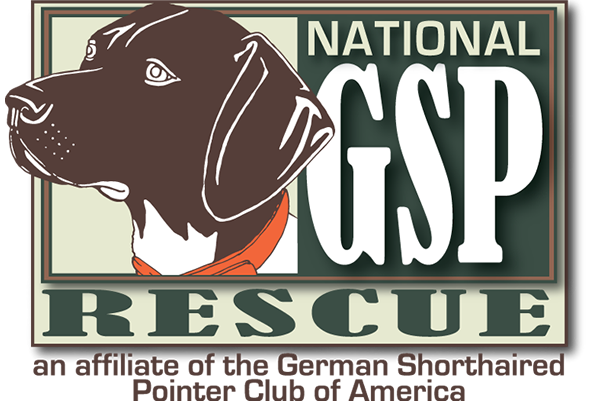 Pointer Rescue, Org (PRO): a non-profit group of coordinators and volunteers across the United States dedicated to the rescue of purebred Pointers. 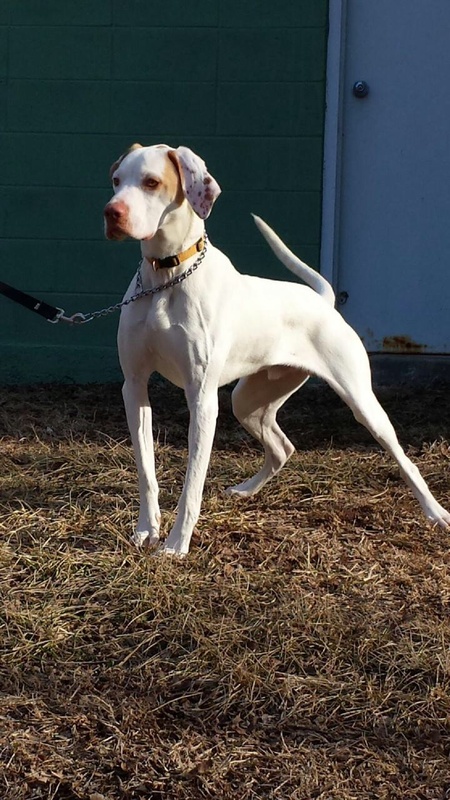 American Pointer Rescue: a national non-profit organization whose mission is to rescue and care for homeless Pointers while working to place them into forever homes. 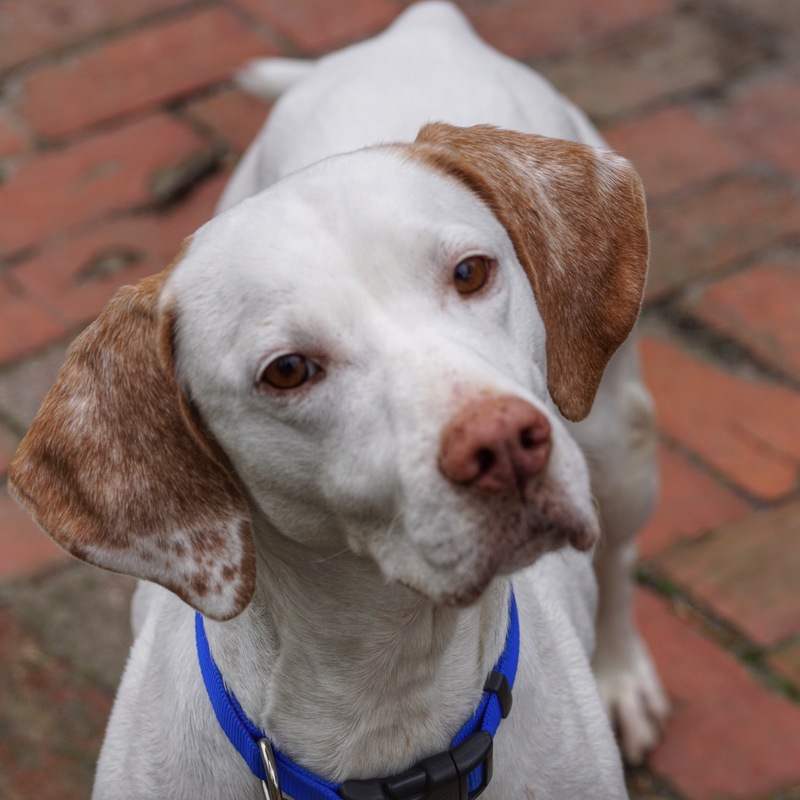 If you would prefer to purchase a registered puppy rather than rescue, the American Pointer Club provides a breeder directory (Click HERE to access the directory). Each breeder listed is a current member in good standing of the APC. However, please be aware that the APC does not recommend, endorse, guarantee or rate breeders, their kennels or their stock. Buyers should be certain to check all matters relating to registration, health, quality and stud agreements with the breeders, sellers or stud owners prior to making any decisions. 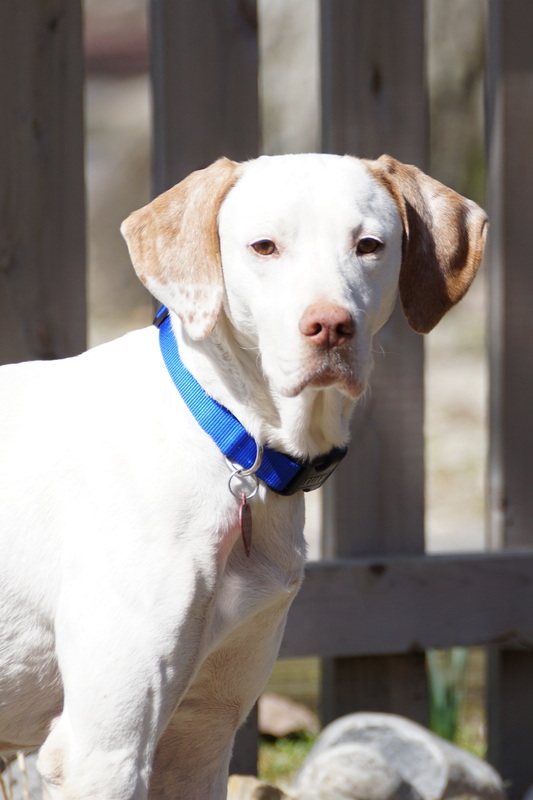 Information in this post is meant only for a generalized summary of the breed, and to put as much information about the breed in one place in hopes to educate potential first-time EP owners/adopters. Please be sure to do your own research on this breed before adding an EP to your family. 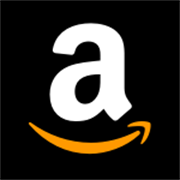 This entry was posted in Pointer. Bookmark the permalink. They are so lean and beautiful, but then I saw the puppies and they are adorable! We love how there are so many different colors and markings!